The Ace Tango 17.3 Turf’s perfect fit has been astoundingly appreciated by many users. Comfortability was one of the frequently mentioned positive reviews by football players. Some players noted that they had better control of the ball when wearing this turf shoe. Several reviewers were impressed with the ankle support that this turf shoe provides. A lot of reviews stated that purchasing Ace Tango 17.3 Turf was an excellent value for their money. “Smart-looking”, “stylish” and “trendy” were just some of the descriptions provided by a considerable number of reviewers. Overall, they liked the shoe design. Some users have noticed the solid ground penetration of this turf shoe. A good number of reviewers feel that the shoes were too tight and constricting. In terms of durability, a couple of those who purchased the shoe noticed the toe area ripping off and separating from the sole after using it in few sessions. A few users brought up the painful sensation they felt in the heel area because of the absence of a solid heel padding for protection. The Adidas Ace Tango 17.3 Turf appears to be an ultimate turf shoe package with all the overwhelmingly positive reviews from actual users. From its looks to performance, it has been regarded as impressive. Its inexpensive rate makes most reviewers think that they are getting the best value for their money. However, there are concerns about its small size and narrow fit. Due to this, issues with heel pain became one of the noticeable complaints. Unboxing the Ace Tango 17.3!!!!! Adidas promises noteworthy control and touch features with Ace Tango 17.3 Turf. Most of these are specific to improving turf ground performance. For one, this shoe is made with an upper labeled as Control Feel. Comfort fit is guaranteed with this feature as the upper material conforms to the shape of the foot with the aid of the sock-like extension. The outsole is produced with Total Control feature that aims to enhance ground grip and acceleration in short pile synthetic grass. This shoe is all about being in control, one dominant component essential in artificial turf games. The turf shoe is available in men’s version. Sizes range from 6.5 to 13.5. The upper provides a snug fit with its soft Control Feel upper that can be adjusted through a lacing system. The outsole is made to solidly withstand short-bladed synthetic fiber or what is known as artificial turf. Labeled as Total Control, the outsole is characterized by multiple circular knobs intended for acceleration and stability on the field. The material used for the sole is rubber. This is an excellent element for traction and serves as an anti-slip factor. A combination of textile and synthetic is seen through Ace Tango 17.3 Turf’s upper. The mid top style collar is made of smooth, elastic textile that serves as ankle support with a sock-like sensation. The central part is made of synthetic material that mimics a leathery feel while what flows through the toe area is a textured pattern made to enhance ball touch. The classic Adidas stripes on both sides complete the distinct turf package. The following colorways are available for Ace Tango 17.3 Turf: Energy Aqua / Running White / Legend Ink and Solar Orange / Core Black / Solar Red. 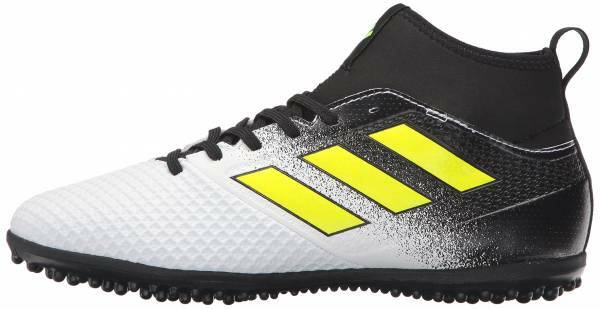 The Adidas Ace collection is discontinued and is updated with the Predator collection which includes football boots such as Adidas Predator 19.1 Firm Ground and Adidas Predator 19.1 Trainers.